Vacation rental companies can’t afford to ignore LinkedIn. However, many don’t realize the valuable connections, qualified leads, and bookings they are missing by neglecting LinkedIn. Compared to other social networks, statistics show that the people who follow a LinkedIn company page are four times more likely to purchase from that company. Not sure how to leverage LinkedIn? 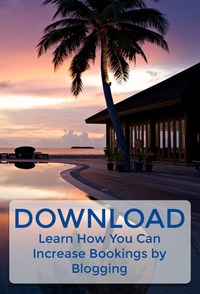 Here’s how you can utilize it to grow your vacation rental business. Did you talk to someone who expressed interest in renting from you, or in placing their home in your rental program? Maybe you did a consult with a potential bride or corporate group. After encountering a prospect, connect with them on LinkedIn to foster that relationship. If you post helpful information daily on LinkedIn, that connection will regularly see that you and your company are credible and helpful. This will keep your company top-of-mind as they are deciding what company to choose. You may also learn more information about the person, which can help if you follow-up by phone or email. If you have an email marketing strategy (which you should), then you probably stay in touch with past renters via an email newsletter or other email communications. In your next email to past renters, add a message inviting them to follow your company on LinkedIn. You can include your other social media networks in that invitation, as well. If past renters connect with you on LinkedIn and you regularly provide helpful LinkedIn updates, you’ll remain top-of-mind as they make their future vacation rental plans. If you and your company actively engage on LinkedIn, it will benefit your website traffic and search engine optimization. LinkedIn activity can lead people to your website, distribute your company’s content, encourage social sharing, and generate quality links. All of these benefits contribute to strong search engine optimization, which leads to favorable search engine rankings. The more employees your company has on LinkedIn, the better it is for your website traffic– as long as they are sharing your company’s content and connecting with people. Are you creating blog posts, e-books, YouTube videos or other information for your content marketing strategy? If so, LinkedIn is another beneficial place to publish that content. You’ll reach your target audience and get more out of your content efforts. Who wouldn’t want to rent from the top vacation rental experts? If you post helpful content regularly, your connections will see your name frequently – probably more frequently than your competition. It won’t take long for them to consider your company to be the local expert. Have you been trying to recruit the top-performing team member from a competitor? Connect and stay in touch with that person via LinkedIn. You’ll help your recruitment efforts if they see your company is an industry expert and knows how to use LinkedIn for marketing. Even if you aren’t looking for talent right now, you should connect with local vacation rental professionals. By doing so, you’ll have resumes and potential candidates handy when a staffing need arises. Before you can reap the benefits described above, you need to establish a foundation for your LinkedIn strategy. Check out these seven steps for setting up your personal profile and company page for LinkedIn success. If you aren’t using LinkedIn to grow your vacation rental marketing business, now is the time to stop neglecting it and take your vacation rental Internet marketing strategy to the next level. This entry was posted in Blog, Content Marketing, Inbound Marketing, SEO, Social Media Marketing, Vacation Rental Marketing. Bookmark the permalink. ← Is Your Vacation Rental Company Set for LinkedIn Success?